This deck of Boom Cards is the perfect compliment to my resource - Magic Math Addition & Subtraction Timed Tests & Activities for Math Fact Fluency. This Boom Card deck corresponds to the 1st subtraction level in my Magic Math program - subtracting with 0. The deck contains 20 digital task cards. 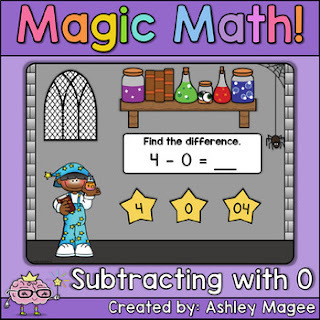 You can preview this resource HERE on Boom Learning..
You can buy the Magic Math Boom Card Bundle with 31 decks/levels of math fact practice here. Purposeful, paperless practice! These Boom Cards™ decks provides students with engaging, digital math fact practice. What is Boom Learning℠ and what are Boom Cards™? Boom Cards™ play on modern browsers (released in the last three years) on interactive whiteboards, computers, tablets, Chromebooks, iPads, iPhones, Android tables and phones, and Kindle-Fire tablets. Boom Cards apps are also available on the App Store, Google Play and the Amazon Kindle Fire store. Not sure your browser is modern enough? Try a free Boom Cards deck first OR Open the preview of this product to see a sample! How do I play my Boom Cards? After you purchase this product, you will download a PDF that will contain a link to your purchased cards on Boom Learning. To redeem your Boom Cards, you will create an account for Bloom Learning. The account that accompanies your purchase allows you to play the Boom Cards on interactive white boards and with individual students using Fast Play. Fast Play does not save student progress reports. BUT- Bloom Learning is currently giving TPT customers/new users one year free at no charge AND gives you the ability to collect and maintain student progress reports/data for up to 80 students! To take advantage of this, you will need to create accounts for your students (usernames and passwords). At the end of your free year, you can choose to renew (or not). If you do not renew, you can continue using your Boom Cards with the Fast Play feature. If you wish to continue tracking student progress, you will need to purchase a (SUPER affordable!) paid account. Boom Learning℠ and Boom Cards™ are the trademarks of Bloom Learning, Inc. Used with permission.